The Horezu area is one of the most beautiful places in the country, being surrounded by nature and with well kept traditions, this subcarpathian region offers the perfect display of the rural regions of Romania and the monuments of the area show how well preserved our culture is. Take a look below and read a summary of all the amazing things that you can visit here. Andra’s House is perfectly positioned with easy access by car to most places in the area. Andra’s House also offers a variety of ways to spend your time during your visit. You can relax yourself playing some table tennis, billiards, darts, or you can take a walk in the park behind our property. You can enjoy a fine tasting of our homemade wine and tuica and you can have a barbecue with us providing everything you need. Your children can jump in our trampoline and they can play around the yard with our friendly dogs. Manastirea Hurezi si Orasul Horezu from GVT Media - Ghid Video Turistic on Vimeo. The Horezu Monastery was founded in 1690 by Constantin Brancoveanu, on the road that was going to the mountain next to Horezu, in the village of Romani. It is considered to be a masterpiece of its “Brancovenesc” style and architecture and is a UNESCO world heritage site. The “Brancovenesc” style is the only true and original style of Romania and it influenced a part of the cultural development of the country. The monastery is just 3 km from Andra’s House. It is a magnificent area and visting this monastery feels like visiting a magical place. We also recommend you to visit the nun cemetery on the hill in the back of the monastery and the small “winter church” that is hidden in the building where the nuns live. Horezu is know as the capital of ceramics in Romania. 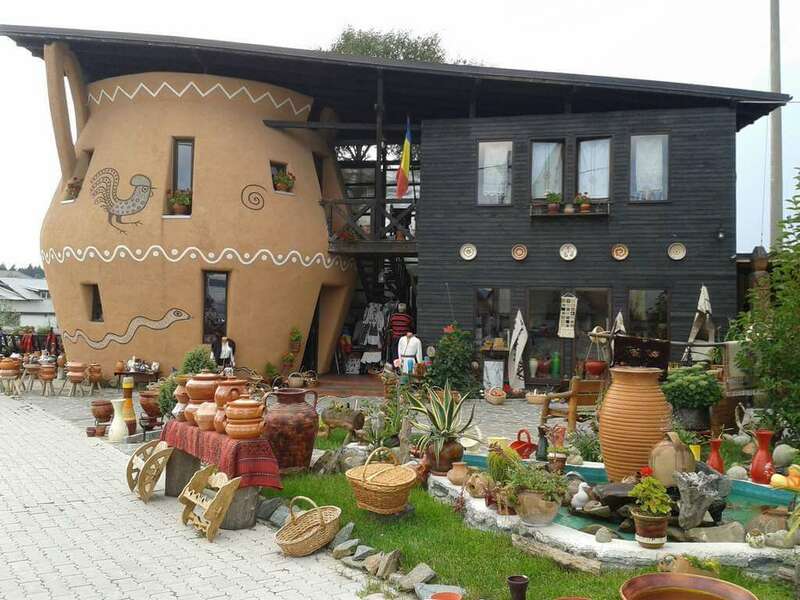 It is the place in Romania where the most ceramics is sold and also created, all of it being made by hand around and in the city. It reflects many generations of knowledge and skills development of ceramics, which is why the craftsmanship of Horezu ceramics was inscribed on UNESCO Intangible Cultural Heritage Lists in December 2012. Each piece is created using special techniques and tools, the uniqueness and personality of the piece being determined by the skills of combining decoration with color. The red and the yellow of Horezu are specific colors of the area, along with brown, green, blue and the so called “Horezu ivory”, with the dominant symbol being the rooster of Horezu. The ancestral heart of this beautiful craft is known as the Olari street of Horezu, the craftmanship being transmitted mostly in family circles. The Olari street is just 2,5 km from Andra’s House and visiting it is a journey which can take you to the past, where this tradition started. Culele de la Măldăreşti, jud.Vâlcea / aerian from GVT Media - Ghid Video Turistic on Vimeo. The village of Maldaresti is the site of 3 historical monuments, one of them being the memorial house of I.Gh. Duca and the other two being fortified battle towers known as “culas”. These culas were built by rich governors with the purpose of retreating and living there during attacks. Cula Greceanu is the oldest of the culas, being first mentioned in the 16th century, thus making it the oldest cula still standing in Romania. The othe cula is called Cula Maldarescu and it was built sometime at the end of the 18th century. These buildings are full of history and are situated in an amazing an pitoresque spot. The memorial house and the culas are still housing objects of furniture, clothing and such from the time they were built and are great pieces of romanian heritage and culture. The culas were also used as sets for many historical movies. They reside just 3,5 km from Andra’s House and can be visited from Tuesday until Sunday from 10:00 to 18:00 in the summer and from 9:00 to 17:00 in the winter. The Transalpina road is the highest road in Romania and certainly the most beautiful, having its highest peak at 2145m. It is the only road that connects Transilvania to Oltenia straight up the mountain. Historians say that it was first built by the roman legions that were conquering the area two millenias ago. Its first nickname was “The path of the devil”, but after 1939 it changed to “The road of the king” after king Carol the 2nd rebuilt it and then went through it with a 4x4 and his son, the soon to be king, Mihai the 1st. The road starts 40km from Andra’s House in the city of Novaci and goes on through the mountains for a total of 148km. The road has a continuity of amazing views of the nature and mountains and is perfect for a weekend ride with your car or motorcycle. The Ranca ski resort is just 20 km from Novaci and is great for beginner skiers and kids. The Transalpina road is closed during the winter, except for the first 20km up to Ranca, which are open almost all year, except for certain days when there is too much snow. Manastirea si Cheile Bistrita - Costesti, jud.Valcea from GVT Media - Ghid Video Turistic on Vimeo. The monastery of Bistrita was build at the end of the 15th century near the river that runs through the valley which bears the same name. Since it was built is has been destroyed and rebuilt three times, having a long history with the leaders and the governors of the area and of the country. The monastery is an extraordinary example of eclectic architecture and has housed many institutions, such as a military hospital, a military school, a typography museum and an institution for the mentally handicapped which were building sculpted furniture there. The monastery has a library which is important for the history of the romanian language and its heritage still survives to this day, even after the monastery was closed for 25 years by the communists. The monastery is built right next to the road which goes through the Bistrita keys, which are an amazing example of the force of nature, showing how the water has sculpted right through the mountain over long periods of time. The monastery and the keys are 12 km from Andra’s House. Manastirea Arnota si Cheile Costestiului , jud.Valcea - aerian from GVT Media - Ghid Video Turistic on Vimeo. Built in the 17th century, the monastery of Arnota resides on a small, but beautiful mountain which faces the village of Costesti and valley of Bistrita. The legend says that the ruler of Wallachia of that time, Matei Basarab, was followed by the turks in the area and he went up the mountain and hid in the bushes that were near a small lake there. He decided to built a monastery on that site after the turks did not find him. The walls of the church of the monastery have some of the most beautiful paintings and frescas that you cand find in the area, making it unique along with its positioning. The view up there is breathtaking, being interesting and different at the same time, as at the bottom of the mountain there is a huge stone quarry that is still functional. The Arnota monastery is 16,5 km from Andra’s House, its mountain being situated next to the Bistrita keys and monastery. Buila-Vanturarita National Park - virtual tour from Florin Stoican on Vimeo. The Buila-Vanturarita national park is the smallest, but the most beautiful national park in Romania.With the tallest height being 1885m, the mountains of the national park have impressive views showing how nature develops in its most beautiful forms. The park is a protected area, having a large and diverse flora and fauna and amazing biodiversity. The Buila-Vanturarita national park houses the amazing “Bears” cave, and “Bats” cave and also the Iezer, Patrunsa and Pahomie hermitages, being also a spiritual and relaxing place. The Trovanti museum is also a part of the park, its rocks making it the most spiritual place in Romania. The beauty of this national park is unmatched, being filled with amazing routes that can take you to the nicest areas in the park. The Ocnele Mari salt mine is a salt mine that has been in use for a long time, but recently it has opened its doors for tourists, having an astonishing surface of 10.000 square meters. The visiting area is at 225m below sea level, having a constant chilling temperature all year. The touristic area has a church, a musem, shops, bars, footbal, tennis and basketball courts, billiards, table tennis and play areas for children. The Ocnele Mari Salt mine is 39 km from Andra’s House and can be visited Monday to Tuesday between 10:00-15:00 and Friday to Sunday between 10:00-17:00. Manastirea Polovragi si Cheile Oltetului from GVT Media - Ghid Video Turistic on Vimeo. The Polovragi Monastery was built at the beginning of the 16th century, being positioned right where the Polovragi keys start. The monastery is one of the few pieces of bizantine architecture and style in the area. The Polovragi keys are another magnificent example of the power of nature, showing how the Oltet river has pierced through the mountain, creating a beautiful valley. The Polovragi keys are housing the beautiful Polovragi cave, being seated just a few hundred meters from the entrance to the keys. A colony of bats lives in the cave in the hibernation period, making it more amazing along with its speology. The Polovragi cave is 26 km from Andra’s House and can be visited from the first of April until the 30th of October, Tuesday till Sunday between 10:00-18:00. The Muierilor cave was first discovered in 1870 and was the first cave to be electrified in Romania. It has a lenght of 7000m meters which span on 4 floors. Some interesting discoveries have been made in the cave, such as human bone fragments, fully fossiled bears and skeletons from wild animals. The legend says that in the past, when men went to fight with attackers, the women, children and the elder went to hide in the cave. The cave is 30km from Andra’s House and can be visited daily from 9:00-20:00 in the summer and from 9:00-17:00 in winter.